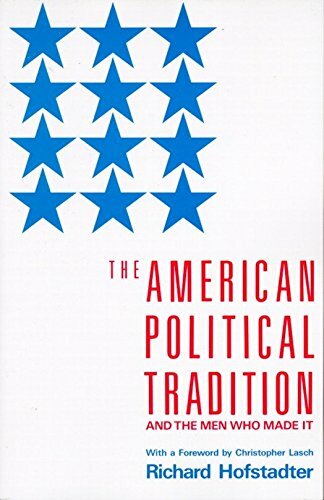 Amazon.com description: Product Description: The American Political Tradition isÂ one of the most influential and widely read historical volumes of our time. First published in 1948,Â its elegance, passion, and iconoclastic erudition laid the groundwork for a totally new understanding of the American past. By writing a "kind of intellectual history of the assumptions behind American politics," Richard Hofstadter changed the way Americans understand the relationship between power and ideas in their national experience. Like only a handful of American historians before himâFrederick Jackson Turner and Charles A. Beard are examplesâHofstadter was able to articulate, in a single work, a historical vision that inspired and shaped an entire generation. About: Biographical portraits of leading American statesmen from Jefferson to F.
Reissue edition from Vintage Books (April 1, 1989); titled "American Political Tradition and the Men Who Made It"
About: Biographical portraits of leading American statesmen from Thomas Jefferson to Franklin D.